When you study success, you will find clues to what many high achievers have in common. There are certain success habits and disciplines that when applied will help you cultivate greater self confidence, more energy, clarity, focus, and success for you as well. And when you’re looking for change that sticks, you’re looking for new habits. Your mindset is the operating system of your life and your beliefs, attitudes, and thoughts have a direct impact upon the results you’re creating and experiencing. The great news is that you can change and shape your own mindset for a more positive focus anytime you choose. Like a muscle in your physical body, your mental muscles also can be strengthened when we give it intentional focus and effort. How often are you intentional focusing on positive thoughts and images? Do you read or listen to books or podcasts that nourish your mind for the positive? Is visualization a part of your success practice? Visualization is the mental imagining of your life and goals as if they are already achieved. You can choose to shape your mindset to focus more on the positive with your own life. While no one has perfectly positive thoughts all of the time, we can practice this success principles to see real progress. 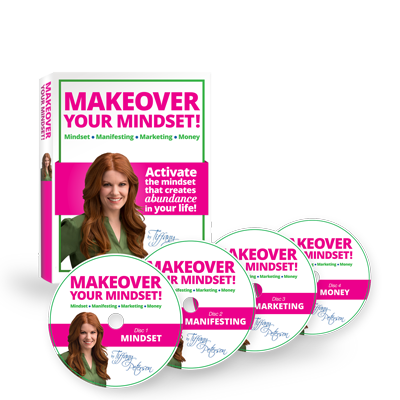 You may also be interested in my Mindset Makeover Home Study Course as well. Clarity is powerful in helping us create lives we love with the intentional architecting of our goals. Do you have clear vision and goals? Or are you stuck with this process? I have a few free resources for you related to visioning and goal setting. Video: How to Set Goals That Really Work! During this content rich training, I share with you the 7 Strategies for Successful Goal Achievement to help you set and achieve your most important goals. We live in busy and noisy world constantly competing for our attention. From a Facebook newsfeed to a barrage of emails and texts, being able to focus on your key priorities is more crucial than ever before. Are you CLEAR on your top priorities? Or do you have an ever growing task list with 27 things at once all feeling like they are the most important priority? Choosing priorities and then implementing success habits such as weekly planning, time blocking, and night before planning are all key success habits to your increase of productivity and focus.